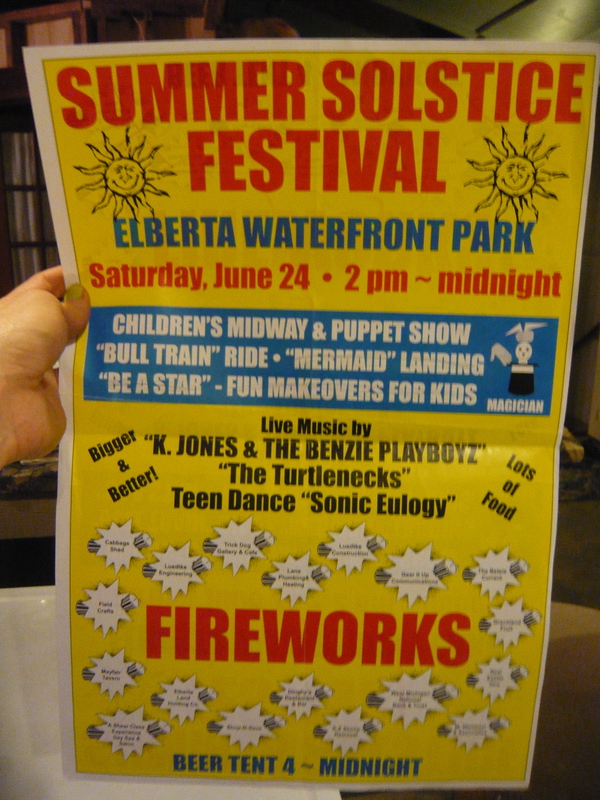 The original Solstice poster, from back in '02. IT’S THE BIGGEST EVENT of summer 2011: June 18, the Elberta Summer Solstice Festival. To get you ready for the longest day of the year, the Alert spoke with Josh Stoltz, who organizes the event along with Josh Herren, Bill Soper, Connie Manke, Jennifer Wilkins, Art Melendez, Adrian Hirsch, and many others. ELBERTA ALERT Whose idea was this? JOSH STOLTZ Jinx Jenks, Elberta’s own festival queen, conceived the Solstice Festival for the opening of the Waterfront Park, back in ’02. A festival for the summer solstice sounds pagan. Will there be pagans there? Everyone around here loves the sun, regardless of religion, and especially after not seeing it for eight months. What’s the worst thing that ever went down during the Solstice Festival? In 2009 we were cranking out so much juice on the stage that we lost power to all the music equipment. We had to redirect our electricity from other sources and the show went on. Who is the most famous or hilarious person to get dunked in the dunk tank? We just started the dunk tank in 2010, and Jeff Sandman created quite a buzz. Based on internet polls, our local police department staff would be the most popular dunkees. For people who have never been to the Solstice festival, do you have any fashion advice? Dos and Don’ts? My fashion advice: DO reduce-reuse-recycle. DON’T watch TV. Bring a long-sleeve shirt/sweatshirt for the time between when the sun starts to set and when you warm up from getting your boogie on. Also: bring sunscreen, money, dancing shoes, an umbrella, a camera and a chair if possible. Anything new this year that I should definitely not miss? Laughter Yoga at about 3 or 4 pm will reoxygenate you in preparation for the nighttime stuff. There’s a rumor that the tug-of-war will pit the Frankfort–Elberta football team against Benzie Central. Ella Riot (formerly My Dear Disco) is our headlining act—they’ll go on late. And of course, the Elberta Alert will have a booth selling T-shirts. Will there be CPR teams on hand in case I have a good time? Local fire, police, and EMS are always on call. Plus Jennifer Wilkins is certified in CPR, so stand near her. The Beer Garden strictly enforces the 21+ age policy. We have a double fence and security on hand to ensure no one under 21 is served alcohol. Also, Solstice is officially a bottled-water-free zone. We’ll have free water for everyone and reusable chalices. All restaurants in the area have an opportunity to vend at the festival. This year, festival organizers are going to offer picnic food and homemade local and organic strawberry shortcake. Also we’ll have Randy dogs, the Conundrum, the Cabbage Shed, and the Lighthouse vending. I’d like to follow the money. The profits depend largely on our sponsor support from the local businesses and from beer sales. All proceeds go directly back into the festival and to support other Elberta Parks and Rec projects and upgrades. What happens if it rains? It doesn’t. Anywhere you can. There’s a lot of space on the west end of the park that doesn’t get used, and this year we’re hoping to open up the field on the east end of the park to help get cars off M-168. What do you get if you win the gross food eating contest? Who should go to the Solstice Festival? Everyone! The kids love it because there are so many games at the kids’ tent, plus the bounce house and the jungle gym. The teens love it because they can hang out with their friends while their parents are distracted. Also, this year Adrian Hirsch is hosting teen bands and a freestyling competition that will end many careers. Adults love to relax and listen to free music in this picture perfect setting. How many children have been conceived during the Solstice Festival? We’ll have the MC ask this year, or check kids’ IDs at the kids’ tent for mid-March birthdays. Attendance grows every year (we count it by the beer consumed), with about 1,500 throughout the day, so it’s a great way to meet new people! 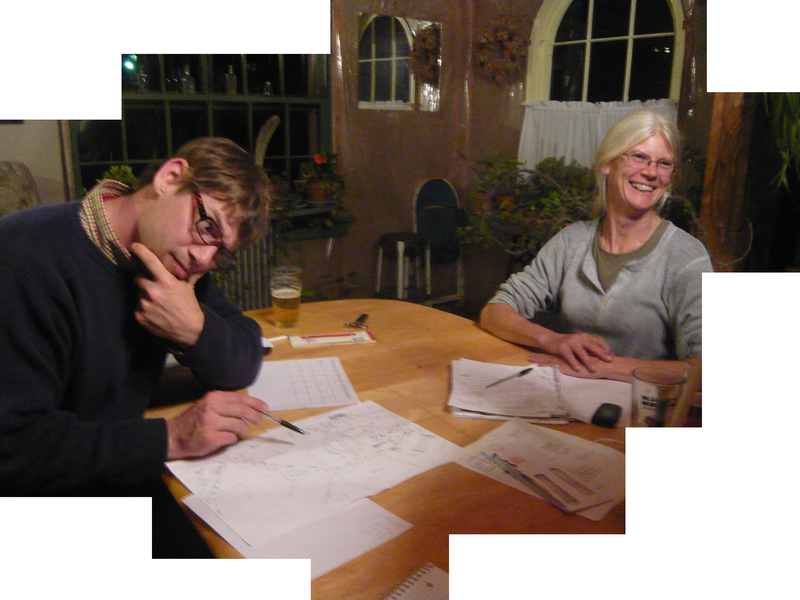 Josh Stoltz and Connie Manke during one of many organizational meetings.